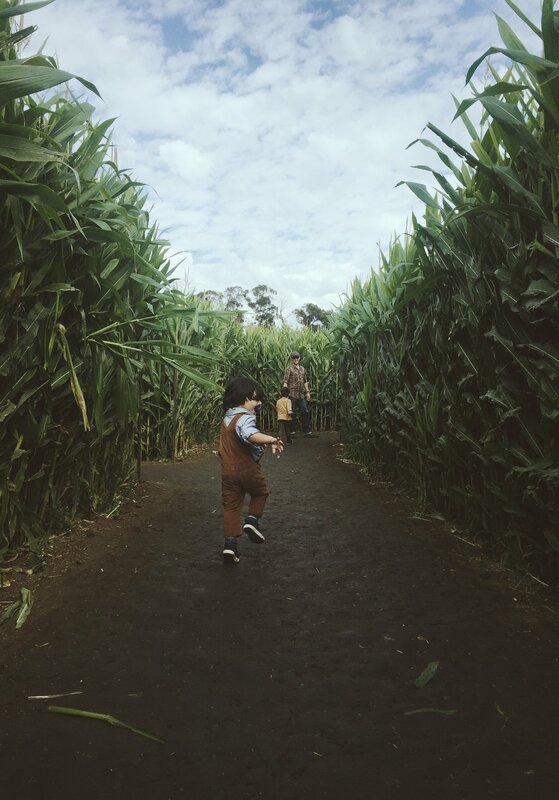 it really took us forever to visit a pumpkin patch this year. like two days before halloween. and now i have probably taken too long to do a post on it. this tends to happen when i'm blogging about something i've already blogged about. we did this exact same thing last year... so what makes it worth writing about twice? well, i will admit that not much changed. we came, we went on a wagon ride, ate greasy food and then left filthy and exhausted. we had a blast. just like last year. what did change was us. this year max could pick up his own pumpkin and say, "is that a pumpkin?" a million times. this year knox could tell us which way he wanted to go, which games he wanted to play, and when he just wanted to be held. that last part remained the same and i love him for it. so that's kind of really it. this year and every year is worth sharing. seasons change and so do we. sometimes it happens so fast you barely remember where you just where... how light your kid once felt in your arms. watching my sons grow, their curiosity and strength gain speed is heavily reflected in this space. simply writing about it is the least i can do to honor and preserve the memory. so, without any further hoopla, here you go. a whole bunch of photos from this year's trip to the harvest festival at underwood farms. this year max's #1 favorite thing to do is JUMP! what knox lacks in jumping capability he makes up for in everything else. like yelling. my obsession with alpacas tripled that day. how is that even possible?! he got this look from his mama. 100%. so proud. and slightly terrifying?! check out my instagram for the video of this crazy feeding encounter though my face kind of says it all here. this beauty totally tried to take a bite out of my dress. what a beeeeeetch. same tractor as last year. i think the huge spider is new though? learned a valuable lesson on how to sit on a pumpkin. totally ok to laugh at my kid right now. i could not get enough. the look of a very happy kid. corn maze! why does it always seem like a good idea? i had all kinds of anxiety up in here. next year i am totally cheating and googling the map. it sure was pretty though. at the end of the day we let max pick two pumpkins to take home with us. he had seen the huge, the misshapen, the bubbly and the ones that are actually squash during our visit to the pumpkin patch. so what two did he choose? two practically identically mini yellow pumpkins. why? perhaps they were easy to carry. or maybe, not every pumpkin is alike, no matter how they look, or how the story is told, and each and everyone one is ripe for the picking. yea, probably just easier to carry.